Our spray foam insulation for residential and commercial customers is applied directly to the breathable roofing membrane between timber rafters in tiled or slated pitched roofs. 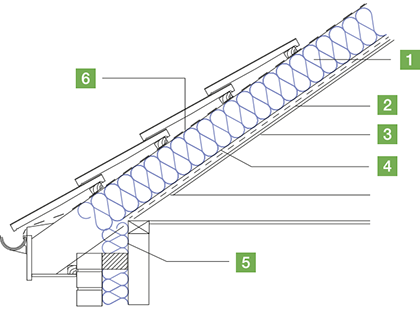 The system minimises unwanted air leakage and air infiltration. WALLTITE® spray foam has a measured water vapour permeability, so does not compromise the performance of any breathable membranes, or cause timbers to dry out when subjected to periods of solar radiation. To find out more about our pitched roof insulation options, get in touch with our team of expert installers today on 0800 690 6338. Energy efficiency – spray foam insulation leaves a minimal amount of surface area without insulation, resulting in an up to 30% decrease in thermal transmission and an airtight building envelope of low permeability, without the need for supplementary material. Sustainability – sustainable over the lifespan of the building, our pitched roof insulation can even prolong the building's lifespan, as it protects against premature deterioration of materials. Design freedom – We provide the specifier with complete design freedom, as the spray foam adapts to the shape of the substrate. This provides an ideal solution for insulating difficult areas such as profiled and curved roofs. The product is self-adhesive and stays fully bonded to the substrate, preventing the possible detachment that is common with other types of insulation. Occupier comfort – spray foam insulation makes a significant contribution to a comfortable indoor climate by creating a draft-free environment that prevents the infiltration of pollutants, toxins and allergens. Reliability – our spray foam is only installed by trained professionals approved by BASF in the UK. Loft space only, non-habitable: insulated between and over rafters to achieve target U-value. Bright Home Renewables Insulation may remain exposed.